Kerala government opposed a petition filed by BJP leader TG Mohandas in Kerala High Court that had sought a ban on non-Hindus entering Sabarimala. The Supreme Court had allowed women of all ages to offer prayers at the Sabarimala temple. 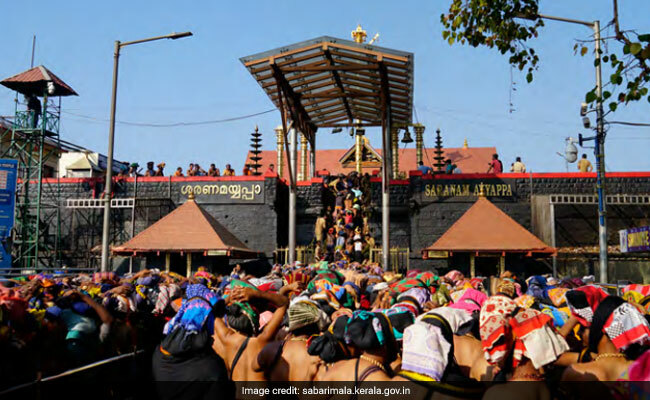 The Sabarimala is a secular temple and the entry of the devotees to the shrine cannot be restricted on the grounds of religion or caste, the Kerala government has said. Opposing a petition filed by BJP leader TG Mohandas in Kerala High Court that had sought a ban on non-Hindus entering the hill shrine, the Left-led government cited customs followed by the Ayyappa devotees over the years to back its claim that the "secular" character of the shrine is "historically- accepted." Mr Mohandas wanted a directive from to enforce a rule under the Kerala Hindu Places of Public Worship (Authorisation of Entry) Act, 1965, that prohibits the entry of non-Hindus into temples in Sabarimala. He had also claimed that "a scheme" to regulate the entry of non-Hindus has been in force in all major temples in the country. The Supreme Court had allowed women of all ages to offer prayers at the temple in a historic order in September. But women of menstruating age weren't able to enter the temple as protesters fought street battles with police to keep them out during the past three occasions when the temple had opened for rituals after the court order. To buttress the claim that the hill shrine is "secular," the state government said the "Vavar nada," a place named after a Sufi saint, Vavar, "co-existed with the temple" at Sannidhanam or the inner courtyard of the shrine. Legend has it that Vavar was a close aide of Lord Ayyappa, the deity at the shrine. Muslims used to pray at "Vavar nada" and at the temple, the state government said, citing it an example of secularism and communal harmony. The Ayyappa devotees of "all castes and religion" offering prayers at the Vavar masjid at Erumeli, some 60 km from Sabarimala, before they head for the hill shrine should be seen as another "secular" practice, the government said. "Petta thullal", a ritualistic dance to celebrate the victory of good over evil in the legend of Lord Ayyappa who killed the demon princess Mahishi "starts from Vavar masjid," the state government pointed out in its preliminary objection to the petition. The state government said it would file a detailed affidavit on the petition later. The government held that the opinion of various stake- holders such as the Wakf Board, Muslim organisations, Vavar Trust and Christian and Tribal organisations should be taken by the court while deciding on the petition. The state government also referred to two historical school of thoughts on Sabarimala, the one that sees Sabariamla as a place of worship that had originally belonged to the Tribal people; another one that said Sabarimala temple was once a Buddhist shrine.